I’m going to keep this short because, well, Dishoom has been done to death. It’s routinely one of the most talked about restaurants on Urbanspoon, they have a very loyal Twitter following and pretty much every food blogger I know has written about them – anything I say will just be reiterating. 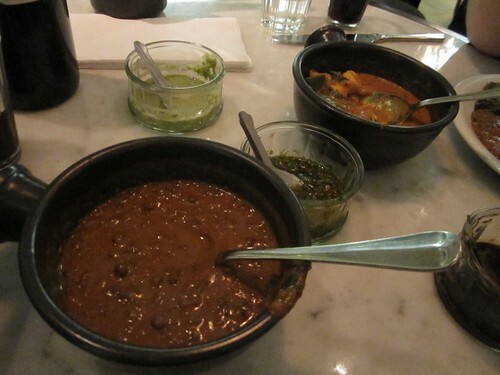 I’ve been to Dishoom now three times – twice for breakfast and once for dinner. All three experiences were consistent in terms of quality and service – it reminded me of service standard back home in the States. 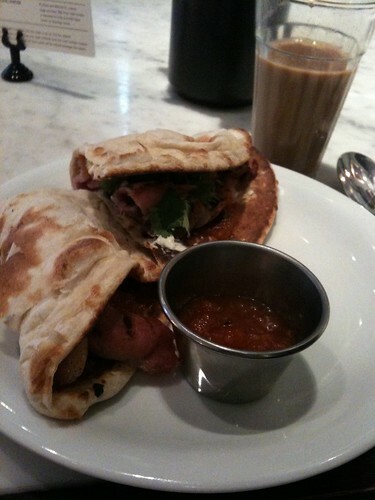 I’ll go on about dinner a bit later, but for me, Dishoom is all about breakfast, particularly the Bacon Naan Roll. It is pretty much the best thing ever. Seriously. Crisp salty bacon with fresh coriander, spicy chutney, other lovely yummy things and wrapped in fresh naan bread all for £3.50 make this the perfect on the go brekkie. It’s not too big either. Perfect for me as I always get overwhelmed by the size of restaurant breakfasts. I went for dinner in between my two breakfast experiences. Maybe I just got the wrong things, because while certain things were very good – I wasn’t over the moon about it. 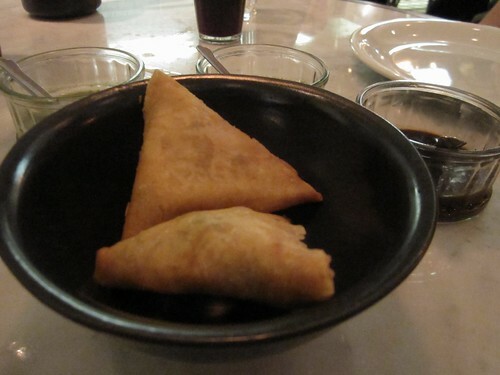 We started off with Vegetable Samosas, a good deal at (£2.90), but pretty tasted pretty standard. 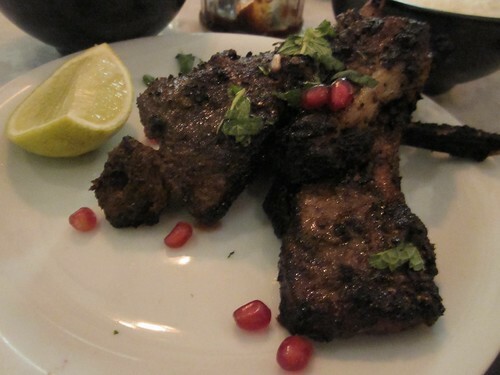 The Spicy Lamb Chops Rubbed with crushed black pepperand chillies (£9.70) were a disappointment as they were too charred to really taste anything. I left half of this uneaten. I really wanted to like everything, and I’ll definitely be back for dinner (and many many many breakfasts, I’m sure), but I’d like to try something else. I was told before I left for my big business trip to Bangalore and Mumbai, ‘don’t try the street food’. I lasted three days. Don’t they know I’m a food blogger and that I have a stomach of iron?! Telling me not to eat street food in India is tantamount to ‘Don’t press the big red button’. It’s going to happen sooner or later. 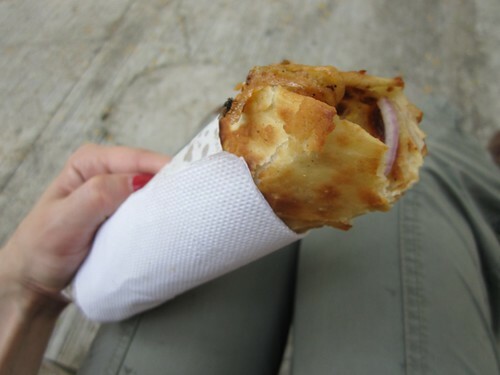 Mooli’s, eat your heart out – this very excellent Chicken Roll I ate in the Bandra neighbourhood of Mumbai was stuffed with spicy sautéed onions, tandoori chicken, peppers and wrapped in crispy flatbread was less than a pound. It was brilliant, and I did not get sick. Moving slightly up the scale, we went to Rajdhani Restaurant, just outside the UB City Mall in Bangalore. We didn’t know what we were getting ourselves into. 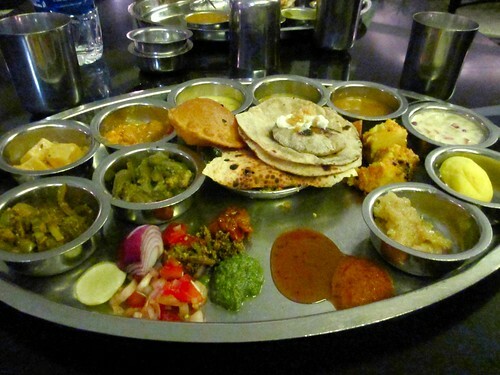 Rajdhani serves Gujarati Thali, which means as soon as you sit down, they just start bringing you little cups of vegetarian Indian food until you ask them to stop. 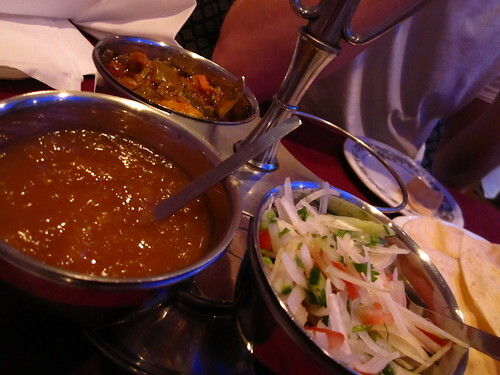 Poppadoms, naan, khichdi, three types of dal, spicy aubergine and so much more – all for less than £5 per person. This was one of the best meals I had all week. On my first night in Bangalore, my host took me to the ITC Royal Gardenia where we had drinks and nibbles. 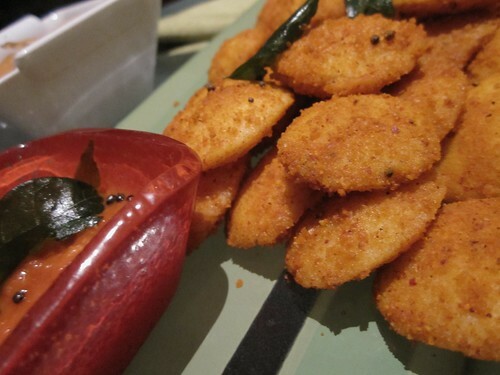 There were the standard veggie crisps and popcorn (of all things), but I also order some Idli – fried pieces of what could be described as a pressed rice gnocchi-type dumpling. Served with a spicy tomato curry sauce, this was ok – but didn’t knock my socks off. Our bill was one of the more expensive nights in Bangalore, pretty much on London prices – about £40 for two glasses of wine, two beers and the starters. In Mumbai, I took out the team to Dome at the Intercontinental Hotel overlooking the Bay, by my colleague’s recommendation. 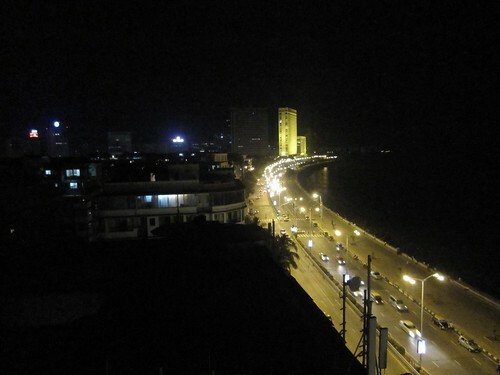 At night, it is absolutely spectacular – one of the best views of Mumbai, I was assured. It was truly beautiful. Unfortunately, the food was fairly average. Apart from a very nice chicken dish with fried sliced potatoes and a rich tarragon cream sauce, I wasn’t overly impressed. It was also very dark, so I didn’t get to take any pictures – a food blogger’s nightmare. 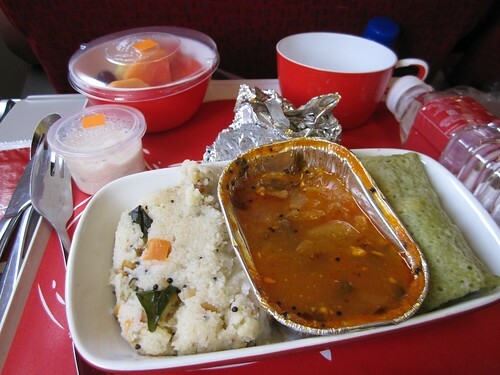 I should also give a bit of credit to Kingfisher Airlines who also provided actual real cutlery on my flight from Bangalore to Mumbai! Seriously impressed, guys. It was a breakfast of dosa, something couscous-like and I’m not entirely sure what else, but it was good. My last night out in Bangalore was at Vembanad, an upscale restaurant in the specialising in Southern Indian cuisine. Southern Indian food still maintains the spiciness and the richness of what most people associate with Indian, but it is much more reliant on fish, dosa and rice, rather than a heavy naan. I started with the Prawn Rassam, a delicious soup of savory spices and small prawns, paired with a slight sweetness from tamarind and a truckload of giant dried chilies. It may have been the spiciest thing I had all week. My lips were burning. My main was a Fish Curry. On first bite, it was much more mild than my soup, which I was disappointed with. 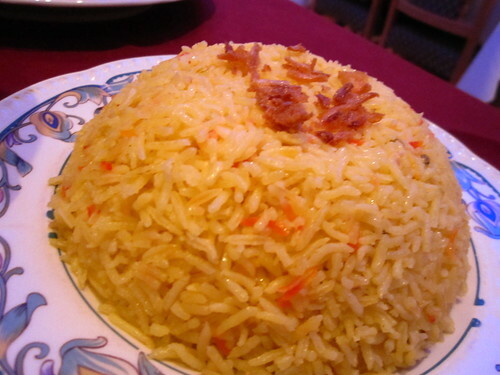 Then, as if by magic, it became spicier over the course of the meal. I had realized that my soup mouth was beginning to wear off, and I could actually taste again. I like it much better after. The fish was a bit overdone, but the curry-infused coconut milk with shallots and slices of mango was superb. India’s a fascinating place. The common thread amongst everything I had was SPICY. And in a very good way. It was the best kind of spice: so hot it makes your mouth tingle, but not so hot that you can’t taste the complex flavours underneath. I was a little worried that I might be sick of the food after 8 days straight of it, but I’m totally not. 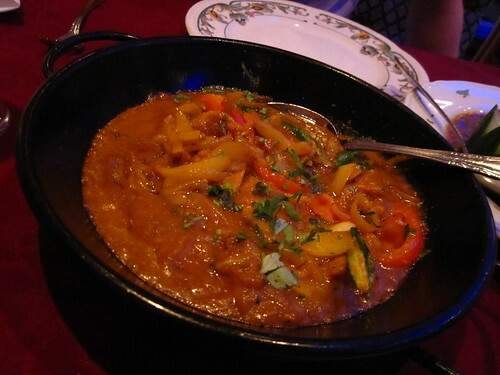 Bring on the curry – I’m hooked. 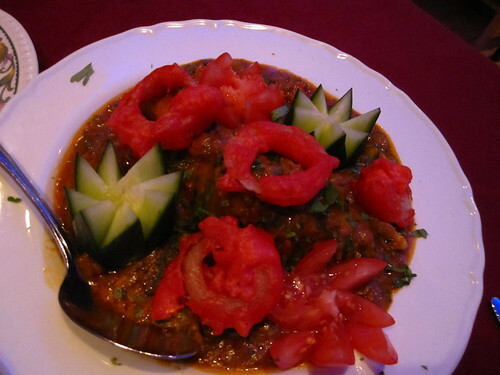 There’s a place – a little, unassuming Indian restaurant in Bounds Green (an area in London which I’ve found most people have never heard of. Hint: one stop north of Wood Geen on the Piccadilly line). The boy lives way up there, and sometimes as a treat after sharing a bottle of wine at the pub down the road, we’ll grab a Saturday night curry. It’s never busy inside, but their takeaway business is hopping, so I think they do well. The owners and servers (likely family and friends) are sweet and attentive; the food is cheap (we eat like kings and the bill is usually under £30 for the two of us including wine); and everything is delicious. I don’t take pictures every time I’m there because if there’s one thing they lack on, it’s presentation – and really, there’s no point in me telling you how good the Lamb Dahl and Saag Paneer is (it just is). Just saying, if you ever find yourself so far north you think you might just be in Scotland, check out Bejoy Tandoori. It’s lovely. P.S. Apologies for the long break in posting. I was off in lovely Barcelona for the Bank Holiday week. Had a lovely time, but didn’t eat anything of particular brilliance apart from Japanese and pizza (which of course, are soo not Catalan cuisine). Ah well – can’t win ’em all. There once was a girl named Melanie Seasons who procrastinated more than anyone in the world. Back in November, a nice man named Lewis asked if she would like to try out some Indian recipes in conjunction with National Curry Week and a promotion that Cobra beer had on. He even picked her up in a zany Karma Cab and brought her to work to explain all about it. Fast forward two months, and she’s just now getting around to writing about it. She is a rubbish blogger friend, clearly. That, I believe, brings us up to speed. I decided, in accordance with January soup detox month, to try to make an Indian inspired soup. 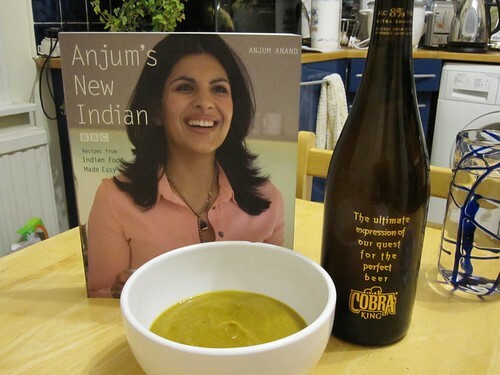 There aren’t too many Indian soups, according to Anjum Anand who is the host of the BBC’s Indian Food Made Easy and author of my newest cookbook, so I had to improvise. Heat the oil in a large pot, and add in the bay leaf, chillies and crushed fennel seeds, and cook over low heat for about a minute. Add in the onion and cook for about 3 minutes or until the onions are slightly translucent. Stir in the turmeric, cumin, coriander, salt, sugar, cinnamon and ginger paste. Simmer for an additional 5 minutes. Add the veg stock and the squash and bring to a boil. Turn down the heat and simmer for about 20 minutes, or until the squash is fully cooked. Stir in the chickpeas and garam masala. Simmer for another 5 minutes, and then blend until smooth. Voila! My only word of advice is that you might have to tweak the spices to taste. I ended up having to add in a lot more to really give it some pop. Once I got the right combination though, this soup really shined. It was easy to make, and I’ve since experimented with a couple of the other recipes in the book (mini corn cakes with coriander mint chutney and Punjabi chicken curry), and they really were a lot easier than I thought Indian food could ever be to cook.